Science was all the rage among progressive young aristocrats in the 17th century. In 1603, in Rome, Federico Cesi and other science-mad young men founded the Accademia dei Lincei, which has endured, in a decidedly broken line, down into our time as Italy's national science academy. 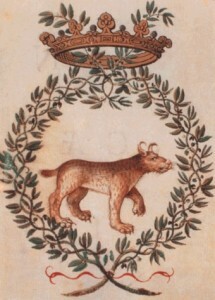 The society, which took its name from the lynx pictured on the title page of Giambattista della Porta's book, Natural Magic, represented an ambitious bid to decipher the mysteries of the natural world. The lynx was admired for its keen eyesight which, metaphorically, the Academy's members hoped to apply to their scientific investigations. While European intellectuals had begun sharing their thoughts in the 16th century, this new academy was the first really seminal scientific body, inspiring imitators all over Europe and introducing the notion that the free flow of information among men of science would push forward the communal body of knowledge. Early members included Della Porta himself, as well as the celebrated Galileo Gallilei, who was so thrilled with the honor that he included a reference to the society on the title pages of all his subsequent books. Science made officials of church and state nervous enough that one of the charter members of the Academy, Johannes Eck, a Dutchman, was banished for a time. While he traveled around Europe, Eck spread the word about the society's work. The Academy published Galileo's Letters on Sunspots in 1613 and The Assayer in 1623. When the authorities of the Catholic Church turned against Galileo and his radical new ideas, which included the Copernican assertion that the earth revolves around the sun, rather than vice versa, which is how the Bible sets things out, the Academy supported him. Galileo later recanted his heliocentrism, which didn't keep him from spending his last days under house arrest. This was a gentler fate than the church was used to handing out to heretics, like Giordano Bruno (who did not recant). Bruno was executed. The support of academies like the Lincei began to make the world less lonely, and perhaps even a safer place, for these early scientists to assert the truth as they saw it. The Black Plague, which wiped out perhaps a third of the population of Europe, demanded an explanation, and the medical establishment of the time responded as well as it could. Hundreds of treatises about the epidemic survive, many of them written in the mid-14th century, when the plague was at its height. One written by members of the faculty at the medical school at the University of Paris, in response to a request from their king, Philip VI, mixed humoral and miasmic theories: The planets had aligned in such a way as to poison the air. Another theory held that a series of earthquakes in Europe had released corrupt air from the middle of the earth. A third had the plague wafting in on noxious winds from the equator. The cause of the plague was actually Yersinia pestis, a murderous bacterium spread by the bite of rodent fleas in the primary, "bubonic" phase, characterized by swollen lymph nodes and other symptoms. The plague can also be spread by infected droplets exhaled by its victims in a less common but deadlier "pneumonic" phase. The plague was a catastrophe for Europe, but it did usher in reforms. It pushed the medical community toward a more professional approach to its practice, an increased emphasis on public health and the establishment of hospitals that would treat the sick, rather than merely warehouse them away from the healthy population, according to The Black Death: Natural and Human Disaster in Medieval Europe, by Robert S. Gottfried. Frustration with the utter failure of the medical establishment to discern the pandemic's cause, stop its spread or treat it effectively helped create an environment from which the scientific method emerged.